We are incredibly honoured to have won the ‘Clinical Research Team of the Year’. The finals day was incredibly challenging and the competition tough! But it was an excellent for each of us to develop our team-work, communication and problem solving skills. Big thank you to PharmaTimes for organising such an excellent competition and all the judges involved on the day. Winning the Aspiring Clinical Research Associate category was a great honour and I am proud to have received this recognition from PharmaTimes against such great competition. Competing in International Clinical Researcher of the Year was a real challenge and further developed my presentation abilities and broader skill set key to the clinical research associate role. I really enjoyed the process and I look forward to the challenge again next year. “I thoroughly enjoyed participating in the International Clinical Researcher of the Year competition. It provided an opportunity for me to move out of my comfort zone, learn a lot about myself and to meet fellow competitors and judges from not only my own company but wider within our industry. It was hugely rewarding and winning my category was the icing on the cake! Winning the company of the year solidifies my belief that it is the people that make PRA and it is that strength which in turn makes a real difference for patients globally. 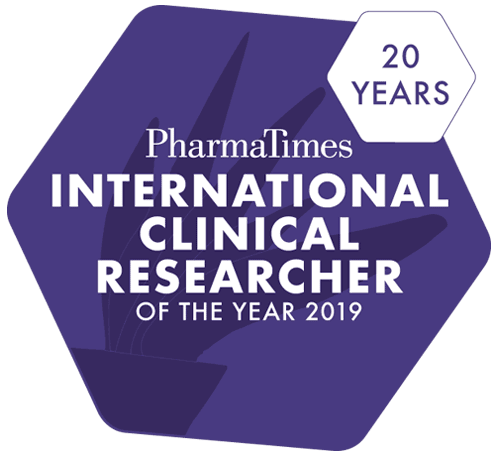 Taking part in PharmaTimes International Clinical Researcher of the Year was a challenging, exciting and fun experience. Not only did I finally read in depth the ICH GCP, but I also got a chance to stop and really think about our important role as CRAs in the world of clinical trials. The PharmaTimes competition enabled me to a challenge myself, to meet fellow clinical research professionals from all over the world, and was overall a wonderful opportunity that I greatly appreciate and recommend." It was an amazing experience. I was able to interact with colleagues from Europe and Asia Pacific and I found the competition itself both challenging and rewarding. Participation in the finals has helped my career in allowing me to progress further to become CRA II at PRA, while the feedback provided has allowed me to determine areas I can focus on to improve. Overall it is something that I would strongly encourage CRA’s to participate as the knowledge and experience gained has been invaluable for me, both professionally and personally. In terms of my career, taking part has really helped put me on the radar for senior management and since the competition I have been promoted to manager of clinical operations - the recognition from PharmaTimes definitely helped! The PharmaTimes competition was an incredible and fantastic opportunity to network with and benchmark my professional skills amongst industry colleagues. It was an invaluable experience that I thoroughly enjoyed which helped elevate my professional profile and progress my career in the CRA role. As a finalist, it was great to compete with such an amazing talent pool and whilst the final stage was challenging, it was a wonderful opportunity to identify areas of improvement which helped in my professional development. It was very humbling to be recongised by industry stalwarts. To know that your hard work and aptitude is not only appreciated by my colleagues but also by other industry leaders is very rewarding. It is also very satisfying to know that I played my part in our company winning the overall award. It was definitely an enjoyable experience from the first to the last stage, made even sweeter by taking home the gong. What I gained most was knowledge and expertise as I had to undergo a lot of self-learning and research in my own time in order to pass the exam and generate an accurate and competitive essay. The experience definitely highlighted gaps in my knowledge but at the same time gave me vast amounts of confidence in my current abilities as I was given some great feedback from the judges. We can all improve the way we work and competitions such as this provide an ideal platform. From networking opportunities to taking the time to self-reflect and challenge your work practices, I think there are many benefits from the competition. An assessment of skills and performance is a great way to be challenged. The international reputation of the PharmaTimes competitions and the recognition from the whole industry brings a feeling of acknowledgement of our talents – it must feel similar to winning an Oscar! The competition was a golden opportunity to challenge myself and find the time to stop and think outside the box. I especially enjoyed the friendly but professional atmosphere during the finals and the interesting discussion with board members during my presentation. I found the whole process very motivating, particularly being able to measure my skills against some of the best project managers out there. It was a true learning experience. This competition felt like a very personal journey for me and I saw it as a way to affirm to myself that I do know my role and that I am good at what I do. I was happy enough to have been a finalist, but to win was overwhelming. I would encourage people to enter the competition and experience it – you never know what you may learn about yourself.